One of my favorite things about living in the Northeast is the fall foliage. I love the change of seasons, and we look forward to seeing the leaves change. 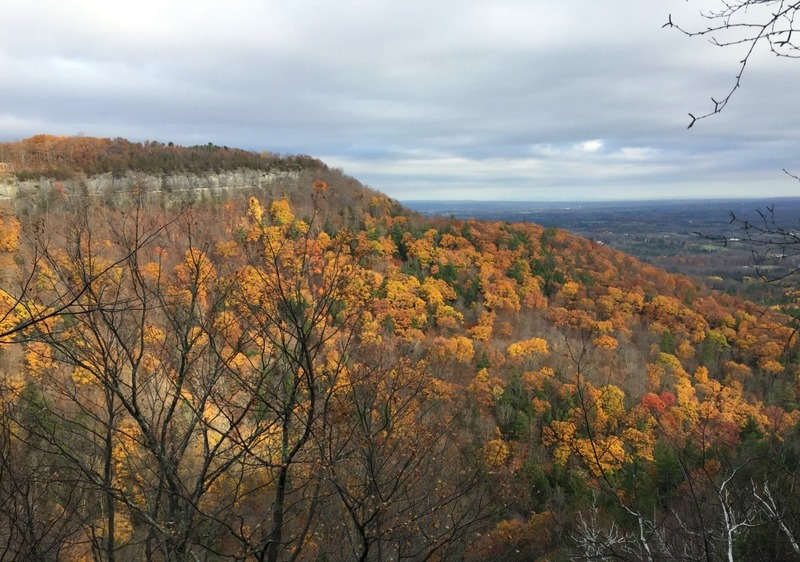 When I think about leaf peeping, I usually think about the Indian Ladder Trail. 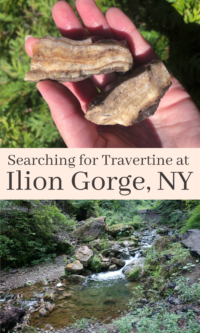 If you live in the Capital Region, this hike is not to be missed! 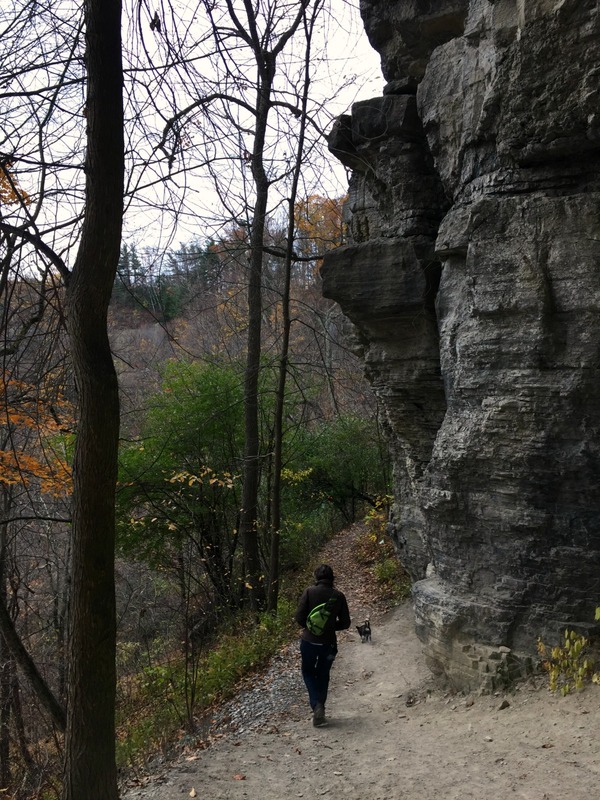 This trail is part of John Boyd Thacher State Park, located in Voorheesville, which is a part of the Albany area. While the trail is not particularly long, it makes for a nice scenic hike, and afterwards you can have a picnic and play on the playgrounds. We usually park by the “yellow playground” and walk towards the direction of the new visitor’s center, where you find an entrance. If you search Google Maps for “Indian Ladder Trail”, it should pop up. The trail is a loop, so you hike down to the main trail, and can loop back to your starting point on the upper trail. The hike starts with a metal staircase. While it is steep, it is sturdy and has hand rails. There are a few spots where you have to go up or down staircases, so keep this in mind as far as hiking ability. For the most part, the trail is easy. There is so much beautiful scenery to see on this hike. We have brought friends and family on the trail who were from out of town, and they had a great time. The views are quite impressive, and pretty cool that this is just a stone’s throw from Albany. 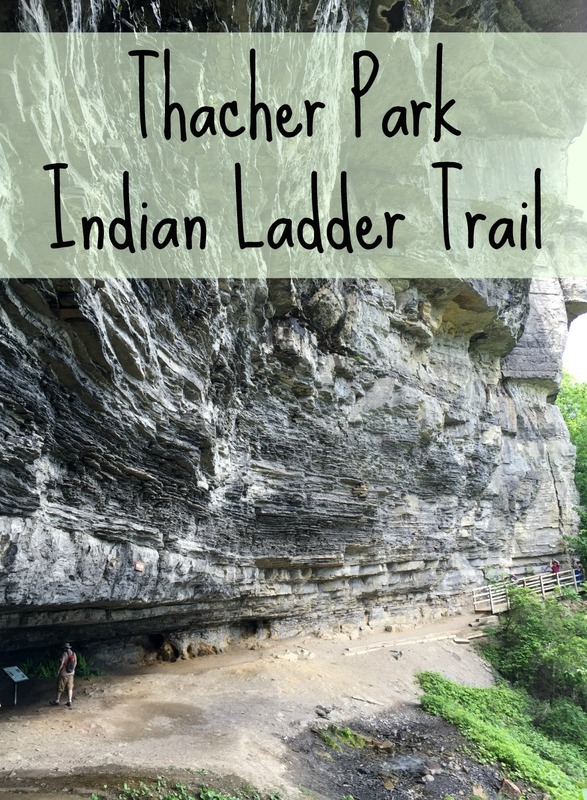 One of the fun things about the Indian Ladder Trail is that depending on the time of year, the scenery is very different. Sometimes when we go, there is an intense waterfall – and other times there is no waterfall at all. 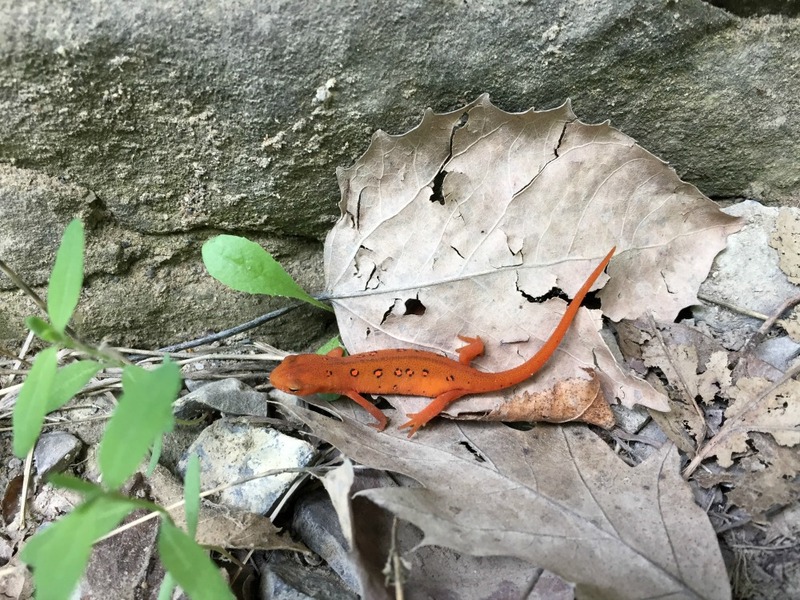 Sometimes we see lots of red efts, but it depends on the time of year. 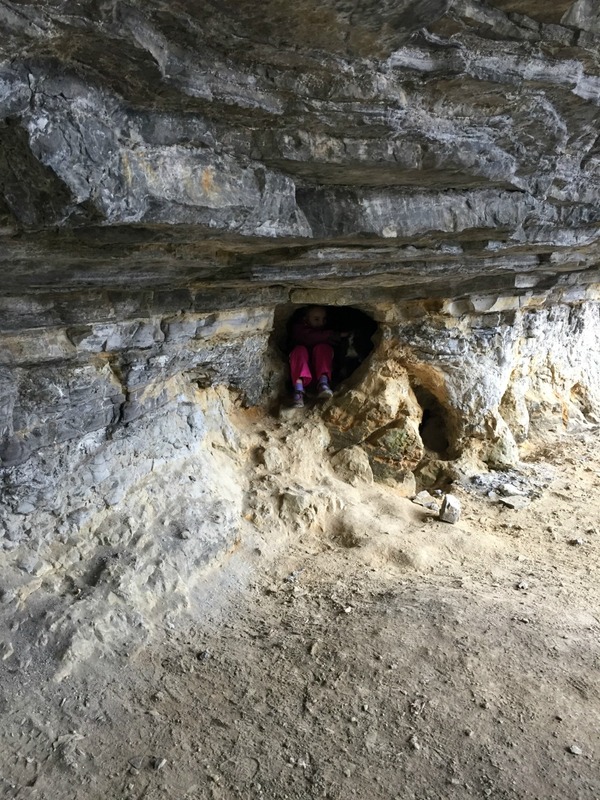 Our kids have enjoyed going on the trail several times, keeping an eye out for things they can find in nature, from critters to “fairy ponds” where water collects under the waterfall, or nooks to check out. There are some informative signs along the way that provide some really interesting history about the park. After we are done, we stop to take a snack break, or the kids head right to the playgrounds or zipline. 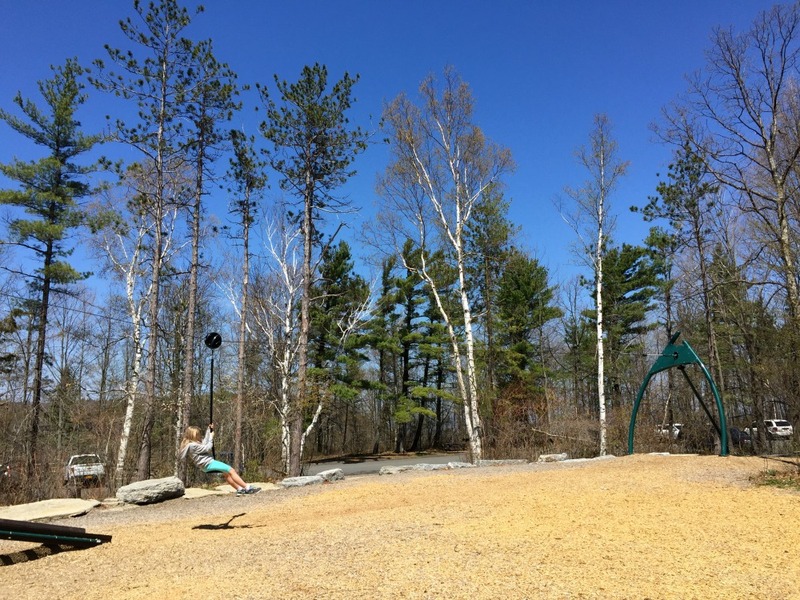 There is a yellow playground close to the trailhead, then a younger kid’s playground, and if you keep walking, you’ll find a zipline and small rock wall. The kids love going on this and it is fun for all ages. ~ BE CAREFUL. Especially with kids and dogs. For younger kids, it is imperative that they are good listeners. There are spots where they need to stay away from the edge, as there are steep drop offs, and they should be careful on the staircases as well (I usually have a parent walk in front and in back). ~ Bring snacks/water. Although this is by no means a long hike, it helps to be prepared – and so many times, we end up spending hours in the park between the trail and playground – so by then, everyone is thirsty and hungry. ~ We usually go in the morning to avoid any crowds. It is nice to enjoy the scenery when it is quiet, and I imagine there are times the trail gets busy. Plus, less crowds means the possibility of some great photos! ~ Check out the new visitor’s center. (It is currently being completed). ~ And of course, be respectful. Leave no trace. This is a great message for kids to learn at a young age, so lead by example! Leave flora and fauna alone. Pick up litter along the way if you can. 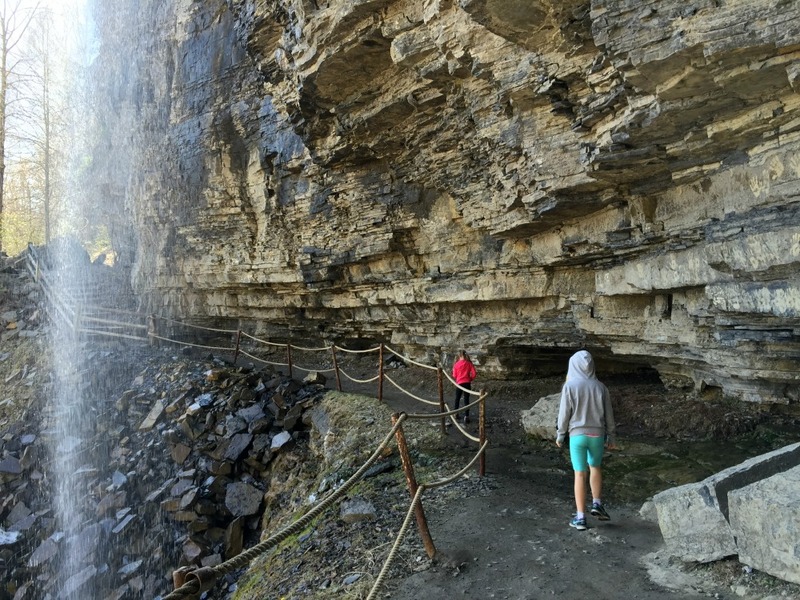 The Indian Ladder Trail is open 5/1-11/15, weather permitting. Keep in mind that the trail will be gated and inaccessible when it is closed, so check their website or keep in mind that it may be locked 11/15-5/1. Check out the NYS Park website for more info. These are such lovely photos and scenes. I would really enjoy visiting a place like this and I know I would really like to see Indian Ladder Trail. Wow… that looks like a neat place to hike. We will be out that way the end of March but looks like it’s not open. Will have to try again and come in the summer. That is amazing! You really can’t beat getting out and exploring nature. I’d love to hike this trail. That is such a beautiful area. I’d love to visit and take some photos there. If I’m in the area, I’ll be sure to visit Indian Ladder Trail. That is a beautiful area. I’d love to get out there and explore it with the kids. I have never visited upstate New York, but it looks like I need to change that. Those limestone cliffs are breathtaking! Now THIS is my type of activity! I too love the seasons and could not live anywhere that we did not have all four. Thank you for sharing this place with us! This looks like an amazing place! Great photos! That hike looks amazing! I need to go on more hikes this spring/summer with the family! That looks like a beautiful area to hike. It’s been a long time since we last went hiking. I should plan more hikes for the family. We love to go hiking and this trail looks amazing. It would be a great place to go for a hike and explore. This is such a great place to visit! I would love to go there. What a beautiful place to take the family. I love outdoor places where we can go and hike. We don’t really have changing leaves around here in fall so it’s fun to see your photo of the gorgeous trees. I miss being able to go to state parks to go fishing and hiking. We just don’t have much where I live or its way too hot. We used to go hiking when I was younger. What a beautiful place to hike. I haven’t been hiking in years. I will have to see what places are in my area and check this out in the future. This looks like quite the trail. What a great way to get outside and enjoy the great outdoors with your family! What an absolutely BEAUTIFUL place. I love those rock walls–stunning! My boys and I would love to hike a path like this–wish we lived closer! Wow – that looks like a really awesome trail. You got some really beautiful pics! I need to get outdoors more and try hiking! You make it look fun and the view is gorgeous! Ok, this location is seriously beyond stunning! I NEED to go here! And that little orange lizard is adorable! Wow, what a beautiful park. The photos are gorgeous, I was telling my husband yesterday about going to some of the park near us since the weather is cold now. I love walking looking at the beautiful nature color. This is lovely. We have a similar state park by us but I don’t think it has quite so many rock formations.